Moderate due significant elevation, some rocky footing. Again I decided to do a cluster of shorter hikes and today I chose to hike in an area just north of the Rhode Island border. 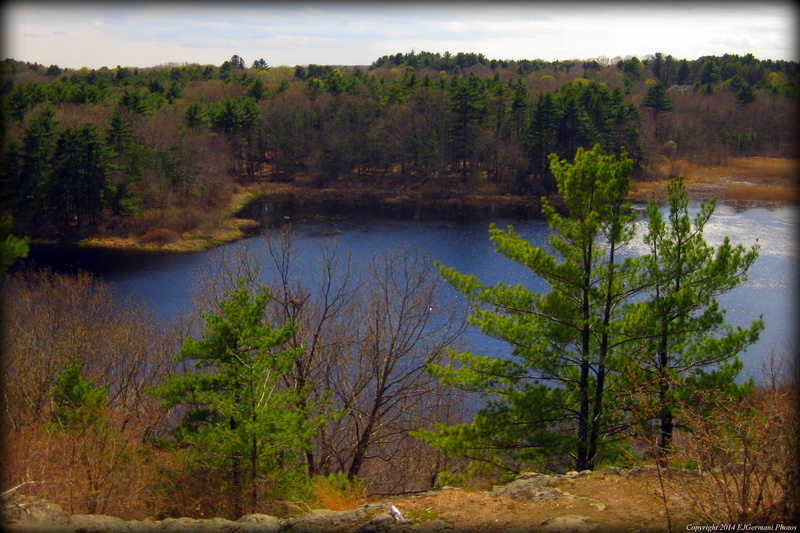 Joined by a fellow hiker today, Joe’s Rock would be the first of three hikes today in the Wrentham/Foxboro area. We started the hike from the parking area following the trail over a small stream to the first intersection. There we turned left following a trail that followed (for the most part) the shore of the pond crossing a small dam and waterfall. The trail leads through an area of pines and a small picnic area before crossing a stone wall onto private property. At the wall we retraced our steps back to the first intersection. We then turned left here and started the climb up the hill. At the next intersection we went left quickly climbing to the top of Joe’s Rock. The view of the pond below and the hills in the distance are well worth the climb. We then continued on the trail following downhill and to the right through a stretch of rocky footing before returning to the last split. From here we retraced our steps back to the parking area coming across a garter snake before leaving. I did not find a trail map on-line for this hike.